45 DAYS UNTIL THE NUTRITION CHALLENGE IS OVER!!! By now you are 25% in (15 days). You should be passed the lethargic state. Everyone will adapt at a different rate, but this is your body reprogramming itself to the new primary energy sources. No longer is it relying on breads, starches and/or sugary grains, etc. you should feel like you broke through a wall and that extra kick of endurance is credited to the new eating habits. Keep it up! Recipe courtesy of Caveman Strong via Bri Willette. By the way, this is one of my top 3 all time favorites. A repost, but well worth pulling out of the archives. Enjoy! Mix all ingredients in a food processor or by hand in a large mixing bowl. Place meat mixture into a large bread pan or a glass baking pan and form into a loaf. Bake at 350 degrees for 1 hour or until meat is no longer pink in the middle. From here the recipe is modified (that means not RX’d – lol) by Bri Willette…. 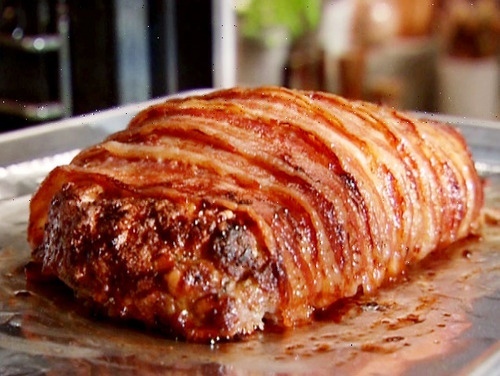 instead of placing mixture into a large bread pan or glass baking dish take 2 packets of Applewood Smoke Bacon from Trader Joes and in an overlapping pattern wrap the bacon around the loaf shaped mixture. First wrap in parchment paper then wrap in foil. Place on baking sheet into oven for the suggested time of 1 hour at 350 degrees. After the 1 hour remove the foil and parchment paper and continue to cook the meatloaf untill the bacon is nice and brown. I continued to cook another 25 minutes or so. ENJOY! Jettison a dumbbell between legs/feet then drop weight, but stay on bar and continue the complex. You may choose load and change load each round. 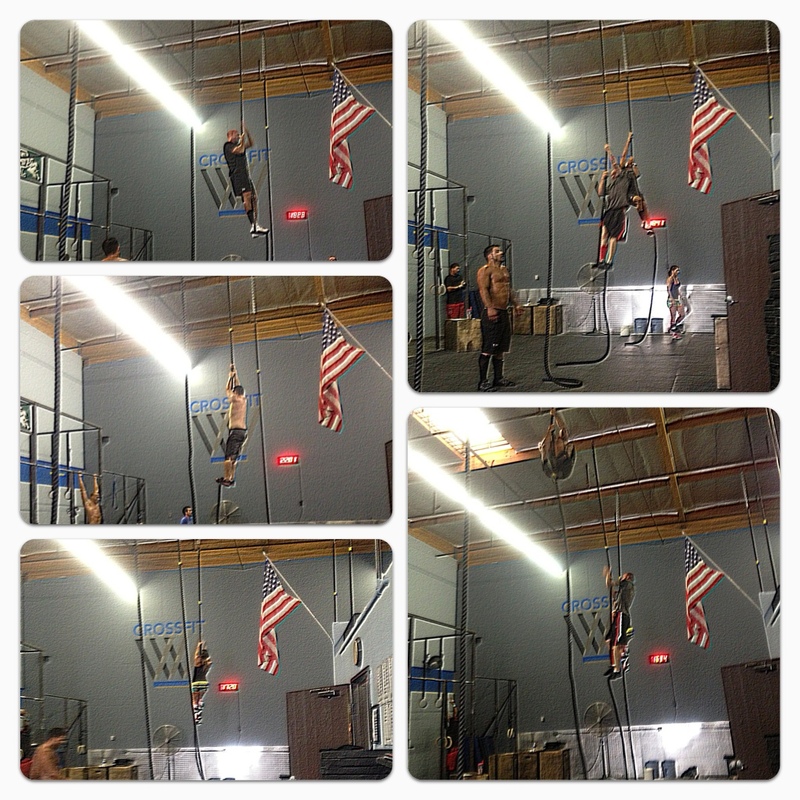 Score is number of kipping pull-ups each round added for total number for all five rounds. Must stay on bar for entire set. Set is over once your drop from the bar. Rest 3 minutes between sets. *NOTE: if you cannot perform weighted or strict pull-ups this workout will be five sets of max effort pull-ups. *NOTE: barbell must be taken from floor. This adds a different dynamic to the workout. Strategize accordingly. Also, this WOD has a 20 minute time cap.